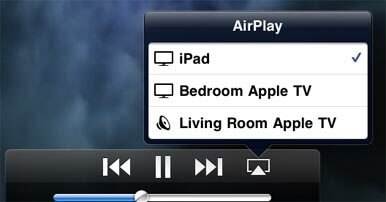 With the Monday release of iOS 4.2 and the Apple TV 4.1 software update, this officially marks the beginning of the AirPlay era. Here’s a closer look at what Apple’s new AirPlay media-streaming technology does and how it works. AirPlay is an evolution of AirTunes, the system that allowed Macs or PCs running iTunes to play audio through either an AirPort Express or an Apple TV. While that functionality still exists (and will be extended to third-party devices), AirPlay expands it to allow the remote playback of video on the second-generation Apple TV. Two different sorts of devices can send audio or video to an Apple TV via AirPlay. Macs or PCs running iTunes 10 will display the AirPlay icon (which looks like a rectangle with a triangle pointing up into it) if there’s an AirPlay-compatible device on the local network. I was able to stream audio and video to an Apple TV from a Mac running iTunes 10 without any trouble. Any iOS device running iOS 4.2 can also send audio or video via AirPlay. To enable AirPlay, you first must select the media you wish to play back, and start it playing. Then tap on the AirPlay icon and select an AirPlay-compatible device. (Devices capable of only streaming audio are signified with a speaker icon; those that can do video, with the picture of a TV set.) After a pause of about two seconds, the video you were watching on your iPad (or iPhone or iPod touch) will appear on the HDTV attached to your Apple TV. The most remarkable thing about streaming HD video from an iPad to an HDTV wasn’t the act of playback, but what happened next: I pressed the iPad’s home button and switched over to the Mail app while the video happily kept on playing. That’s because AirPlay works in the background, continuing to stream media remotely while you do other stuff. Want to write a movie review on your iPad while you’re streaming that movie to your Apple TV? Not a problem. You can even put the iOS device to sleep and toss it in the corner; so long as it’s got battery power and a network connection, it’ll keep streaming. Choose where to play your video from the new AirPlay pop-over menu. You can control AirPlay playback from the iOS device, of course—the standard set of play and pause control buttons are available. But once the streaming starts, you can also just pick up the Apple TV’s remote and control things that way. Once an AirPlay stream is going, it’s really no different from watching a movie on the Apple TV directly. All the standard Apple TV remote commands work, so you can play, pause, fast-forward, and even bring up a chapter list and skip forward. The Apple TV buffers as much of the streamed file as it can, so fast-forwarding is smooth. I tested AirPlay with HD and SD videos from the Videos app, and it worked great. I was also able to use AirPlay with the YouTube app. AirPlay didn’t work, however, when I tried to play back a movie trailer from Apple’s trailers site using the iPad’s Safari Web browser. And several other apps I tried, which do support video playback, simply wouldn’t work with AirPlay—they would display an AirPlay menu, but my Apple TV only showed up as an audio-capable device. (In other words, I could play back my video’s soundtrack on my TV set, but the video would only show up on the iPad.) Presumably developers will be able to update their apps to take better advantage of AirPlay; it sure would be nice to play back live game video from the MLB At Bat app on my TV set when baseball season comes around again. Once you transfer a video from iTunes 10 to an Apple TV, this placeholder graphic appears. But before you think that AirPlay opens the door for apps to do crazy stuff, like showing the output of your favorite game app on your HDTV or playing back random video formats from apps such as VLC Media Player, let me explain how AirPlay video streaming works: One device sends a complete, intact video stream to the Apple TV. That video stream is the actual stream of bits of the video file stored on the iOS device (or, in the case of iTunes, on the Mac or PC’s hard drive). The device the media files are streaming from isn’t processing them in any way—it’s just forwarding them on to the Apple TV, which then decodes them and displays them on your TV. As a result, AirPlay only works with video formats that the Apple TV supports. If you tried to throw an MKV-formatted video you downloaded at your Apple TV, it just wouldn’t work. Likewise, the output of a game app would have to be encoded into an Apple TV-compatible format. AirPlay already comes with a two-second buffering delay; throw in the time it would take to encode video and the output of your game would be impossibly out of sync with your iOS device. One interface quirk of AirPlay on iOS devices that I didn’t like is its requirement that you begin to play a video before sending playback to the Apple TV. On a Mac running iTunes, once you select an AirPlay device as your output destination, it uses that device until you tell it to stop or until that device vanishes from the network. It’s a much better approach than having to start something playing, then quickly switch to the Apple TV via the AirTunes icon every single time. Finally, AirPlay is for more than just video: You can also use it to share photos from within the iOS Photos app. In normal browsing mode, your TV mirrors what’s on your iPhone or iPad, with just a two-second delay. Flip into slideshow mode, and the contents of your slideshow (music included) will play back on your TV while your iOS device shows a placeholder graphic. AirPlay’s an exciting addition to the Apple TV and makes it a more flexible device. I immediately started to see how taking an Apple TV on vacation with you could be a good idea, since you could use it to play back any videos you brought with you on your iPhone or iPad. If you’re on a home network with a computer containing all your media running iTunes (like I do), AirPlay is a little less valuable. At least, until a friend comes over with a movie on his iPhone that you want you to see.